Ever since the debut album in 2003, Beardfish’ fan base has grown worldwide thanks to a constant flow of new album releases filled with high quality prog candy. Simultaneously, they have earned a reputation for their energetic and engaged live shows during their tours around the globe – often as festival headliners. Being one of his personal favorites, Mike Portnoy invited Beardfish to his prog cruise Progressive Nation at Sea 2014, to play with Transatlantic, The Flower Kings and Jon Anderson, among others. 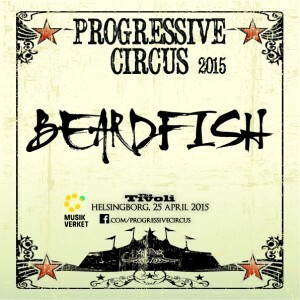 With epic songs, concept albums and quick shifts in musical styles and moods, the Beardfish formula is undoubtedly based in progressive rock, but also in classic rock, aiming to simply write a good rock tune with plenty of strong melodies, groovy riffs and vintage keyboard sounds like Hammond organs, clavinets and ARP synths. The material and its’ production hints at many influences from the 70’ies, borrowing from Frank Zappa’s eclectic approach, King Crimson’s heaviness and Gentle Giant’s beautiful melodies. In January 2015, their eighth album “+4626-COMFORTZONE” will be released on InsideOut. The Progressive Circus 2015 crowd will be among the first to hear the new material live and for this occasion, main composer/singer/keyboardist/guitarist Rikard Sjöblom is joined not only by his ordinary band mates David Zackrisson (guitars), Magnus Östgren (drums) and the spectacular Robert Hansen (bass), but also the extra member Martin Borgh on keyboards to guarantee a very special treatment for the PC15 audience!